I can’t quite believe that it has already been a year since I bought this helmet, and I couldn’t be happier. Yes, there are some points that could be improved, but overall I am satisfied with it. I should probably mention that last July I had a small issue whilst riding around the countryside and I went down. I was riding at about 40mph and hit some diesel on the road that made me lose control of my front wheel. I went down on my right side, as did my bike. My bike slid on the crash bar across the road but besides having to change this part, the bike was perfect! I love how GS’s crash bars protect the bike fully in case of them being dropped. When this happened I was wearing my Schuberth C4 and you can see in the image below how well it protected me. Schuberth C4 helmet after accident. The visor didn’t break, it just scratched. I just removed it before taking this photo. One advantage of Schuberth helmets is that they have 5 years warranty. I also found out, the hard way, that Shuberth offers an Accident Insurance Programme. 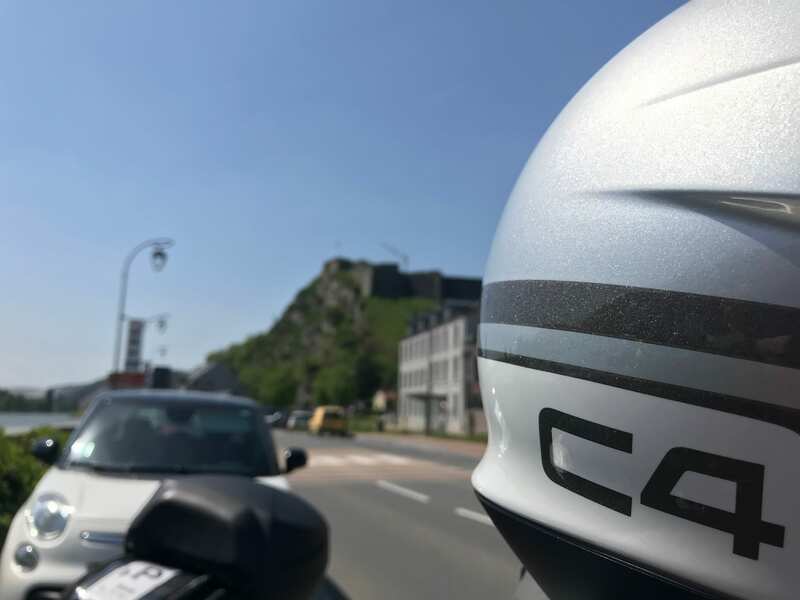 This means that in the case of an accident you can replace your helmet for 1/3 of the price! I was so happy about this as the helmet is quite an expensive part of my gear. Let’s start with the review. First thing to mention is the interior. My current helmet is 10 months old (I got a new one after the accident as mentioned above). Well, it looks like new! I haven’t deemed it necessary to wash the interior yet. After a ride in high temperatures, I usually get a damp cloth and clean a bit the lining but that is all and it still looks like if it just came out of the box. The exterior of the helmet is holding well too. No visible scratches on the surface. The visor has a couple of chips from small stones thrown at me by other vehicles, I have to say these don’t bother me as they don’t affect visibility. The sun visor works brilliantly, the sliding control is easy to use with gloves and the visor is dark enough to protect my eyes, even during sunset where the sun is really low and hits my eyes directly. I haven’t had to remove the sun visor but the external visor is one of the easiest to take of the helmet and put back on. The mechanism is idiot proof and hasn’t deteriorated with time despite removing the visor after almost every ride for cleaning. Something that bothered me after some use was the “pinlock”. For this helmet, Schuberth decided to use their own version of the pinlock system. At the beginning I had no issues with it, but after some time it stopped sealing properly and I had to keep adjusting it after every ride. I was happy when Schuberth said that they would replace their version of the pinlock with an actual branded one. As soon as I found out, I went to Infinity Motorcycles, in Watford, to get my helmet sorted. As usual, the guys from Infinity were brilliant and got my helmet sorted within minutes! The other only issue that I had at the beginning was with the SC1 Advance System. We connected Natalia’s Sena 10S with my helmet. Quality was amazing! But the range was not as good as expected, we could only get between 100 and 200 yards of range. We also experienced problems when attempting to start a conversation. Thanks to the magic of internet, we found a solution for this. Someone contacted us through our previous post and told us to deactivate the “Intercom HD” feature. It seems this feature is to get the maximum sound quality when using the intercom but it also shortens the range. After we turned this option off, we haven’t experienced any issues. The Schuberth app is easy to use and intuitive, this is crucial because the buttons in the unit are not easy to operate with gloves, they are tiny and hard to find with gloves. Comfort wise nothing has changed, the helmet is as comfortable as the first day. The helmet fits me perfectly and doesn’t move at all, not even when riding my BMW R nineT Scrambler which has no fairing or weather protection. Overall, I am as happy as the first day. Besides the negative points I mention, I am glad I bought this helmet. Pity I still cannot support your experience with the C4. It spent a month with Schuberth last year re noise etc & was returned with the problems unfixed. Currently back with them, re being noisey and the visor mechanism is all floppy and the com’s kit is virtually unusable, will not pair, drops out, cannot take calls, occasionally hooks up to the TTom. Still one unhappy customer who has spent serious money on a piece of plastic junk. Have asked for a refund again.